Want a nail polish that doesn't chip the next day? Well Vinylux is the answer! - Top Coat...... and it dries in 8 minutes! Yes you read that right! Buy 2 or more Vinylux Weekly polish and get 30% off! VINYLUX™ is a breakthrough polish system that ensures a week of fashion perfection…without a base coat! Exposure to natural light secures the patent-pending Pro-Light technology, creating an enduring, long-lasting polish. While ordinary polishes become brittle and deteriorate over time, VINYLUX dries naturally to a flawless finish and strengthens its resistance to chips over time. 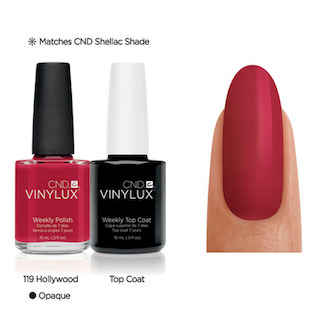 VINYLUX is available in 62 fashion-forward polish colors and 47 colors that match popular CND Shellac™ shades. So go online today and save save save!